The levitation setup is made of solid wood and stained to a nice finish that can be used as a desktop decoration or conversation piece. Pyrolytic Graphite is one of the most diamagnetic materials known to man. Diamagnetic means that the material repels either pole of a magnet. The lifter magnet simply compensates for gravity to allow the floater magnet to balance between the two pyrolytic graphite plates. Levitation occurs when the lifter magnet is just close enough to provide enough force for the floater magnet to overcome it's weight. The floater magnet is then repelled equally by the two graphite plates and becomes suspended in mid-air. 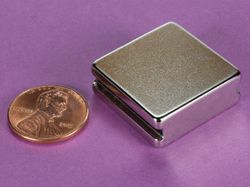 See our recent article about the magnet levitator here. 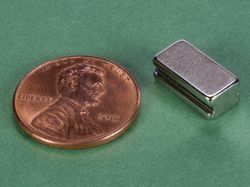 The kit includes the levitation jig shown above complete with pyrolytic graphite as the diamagnetic material, nine neodymium magnets to experiment with, and a detailed instruction sheet. No tricks or batteries required - just SCIENCE! This is an absolutely fascinating experiment for a great price.